What kinds of gifts can you give to writers or aspiring writers? Why would useful Christmas presents be more appreciated? What are useful gifts that you can give to writers? Does knowing that someone is a writer, an aspiring writer or has a hobby of writing make it easier to find the most appropriate Christmas present for said person? If you look around at the stores and shops, whether online or otherwise, you can see a multitude of gift choices from simple to extravagant and from cheap to expensive for all types and kinds of people including writers. But with so many to choose from, how can you narrow down your search further to make things easier for you? Why don't you consider giving them useful Christmas gifts? But what exactly does that mean and what are some of the useful presents that you can choose to give to writers for Christmas? What's so special about giving someone a useful Christmas gift? Anyone would surely be delighted and pleased to receive a gift that is useful. Why? Simply put, it's precisely because the person has a use for the received item. Wouldn't you much prefer to get a gift that you can actually make use of on a regular basis instead of getting something that you have no use for and will just end up being displayed somewhere or put away in storage? Giving someone a useful gift also shows that you put more thought in your choice of present and didn't just randomly select an item and decided that it looked good enough to be given away as a gift. So if you know a writer or an aspiring writer, it wouldn't do to just give this person a mug or some other item that has a writing quote or something, no matter how nice-looking, inspirational, or humorous your gift may be. You should think about what use a writer will have for such things first. 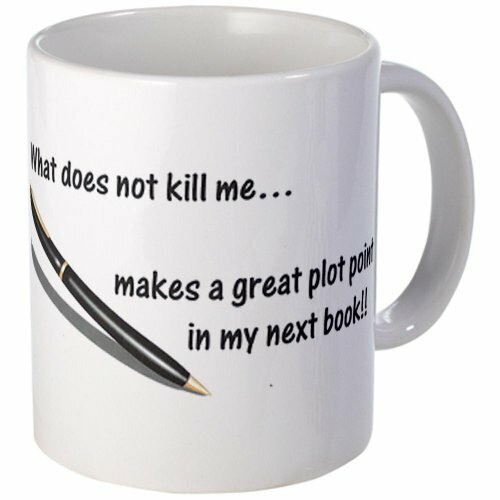 For instance, in the case of a mug with a writing quote, while this may appear to be an appropriate present for a writer, you should take into consideration that a writer will surely already have a mug and likely wouldn't need one even if it has a beautiful design and quote (unless his or her mug just happened to have been broken and he or she is in need of a replacement). There are many other much more appropriate presents that you can choose to give to a writer and these are ones that any aspiring writer will surely appreciate much more than a mere mug or some other such item. Does it matter what your Christmas present looks like? No, it shouldn't matter what your chosen Christmas gift may look like. The present might appear to be simple, ordinary or plain but don't think that it won't be an acceptable gift if it is actually useful. You don't have to go with something shiny, sparkling and extravagantly expensive because it's not the price of the gift that matters. It's the fact that you took the time to get your loved ones presents and actually went and found useful items for them. The recipient of your gift will surely appreciate how much thought you put into his or her present and he or she will surely love and cherish such a useful present. 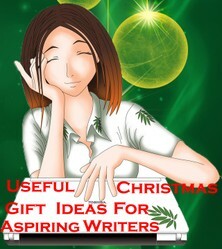 So, what are some of the useful gifts that you can give to writers or aspiring writers for Christmas? Much as you might want to, you can't exactly help a writer with their story or novel by writing it for them. Instead, you can just settle for giving them a present that can help them with their writing. No, Scrivener does not and will not write a novel for the author. That's still entirely up to the writer. However, what Scrivener will do is help make things easier for the writer. 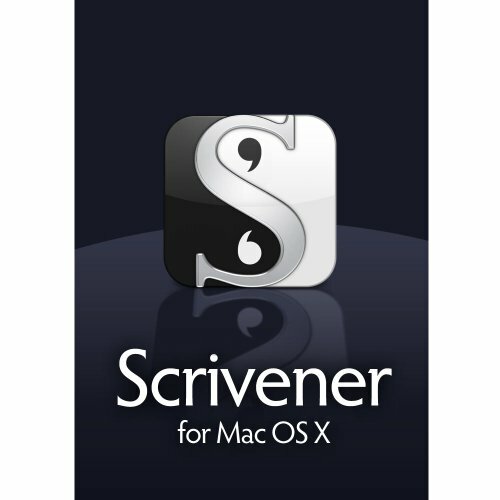 Scrivener is a writing software with a great many features and which is available for both Windows and Mac users. If you know that your friend or loved one is having a hard time writing his or her story, you can consider giving him or her Scrivener. Perhaps the writer is making use of Microsoft Word or some other word processor to write their novel. If so, then it's definitely a good idea to introduce them to Scrivener. Word processors are fine and all but it's extremely difficult to try and write a novel whilst making use of one especially if one is attempting to write something that is really long. The reason for this is the many chapters that a story can have, not to mention character profiles, research, drafts, notes and many other such things that an author needs in order to properly write their story. If all of these things have to be stored in separate documents, it will be difficult to locate what you need when you need it. But, with Scrivener, this is no problem at all because an author can keep everything in one place while still being organized. You can have several documents in one file and you can name these documents and even add short summaries so you know what's in these documents. You can even move things around whenever you want to so whole chapters and scenes can be moved every which way until you find their perfect and proper placement. These are just some of the many different features of Scrivener that a writer will surely love and appreciate. One of the best things is that, even if Scrivener has all these wonderful and useful features, an author doesn't have to make use of all of them if he or she doesn't want to. The writer can just choose which of these awesome features to make use of and ignore the rest until such time that he or she has need of these features. By giving a writer or aspiring writer the Scrivener writing software, you can show that you believe that your friend or relative has potential and you are rooting for him or her to be able to finish her or her novel soon. So you've decided that you do want to give the writer that you know Scrivener as a Christmas present and that's all well and good but, if you notice, it's not exactly possible to wrap this particular gift since you just download it to your PC when you buy it. Aside from just selecting another gift, you can opt to get the writer an Amazon gift card instead. 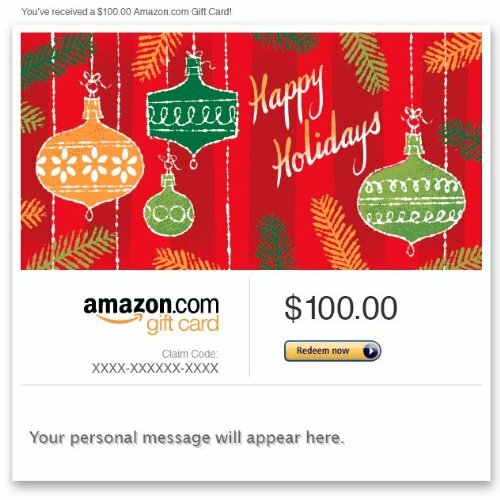 This is because, these gift cards can be used to buy the many different products and items on Amazon.com, including the Scrivener writing software. These gift cards don't even have an expiration date so the recipient can get their chosen items anytime they want to. So you can tell the recipient of your gift all about Scrivener and let them be the ones to get said item for themselves. But one of the really good things about these gift cards is that, if you really have no idea what to give someone as a Christmas gift (regardless of whether or not the person is a writer), you can just give them one of these cards and let them be the ones to choose for themselves. These Amazon gift cards range from a variety of denominations, which you can choose and specify when you purchase one. There are also three versions of these gift cards that you can choose from- the greeting card, the e-mail and the gift card box. 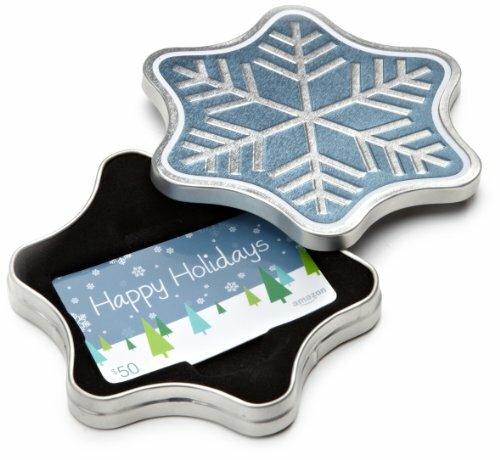 With the e-mail gift card, you can add a message to the recipient of your gift. You can also do the same with the greeting card though it would have to be handwritten. Writers can get inspiration anytime, anywhere. It doesn't matter where they are or what they may be doing. Sometimes, it's really easy for them to just get good ideas for the story they are currently writing or even thoughts for their latest novel. Even if someone has a good memory, sometimes, it's still possible to forget the details of your ideas and thoughts if you are unable to jot it down right away. There are times that, even if you remember what ideas you came up with, it's just not the same or not exactly the same as when you first came up with it as there are some details that you might have missed or already forgotten. As such, writers would definitely appreciate being able to jot down their thoughts or any ideas they may have whenever they want to. Giving them a tablet or even a laptop as a Christmas gift is certainly one way of helping them achieve this. There are a lot of small tablets like the one featured to the right, which has a 10.1-inch display, that appear to be just the right size to be carried around especially since they are pretty lightweight. With this, your writer won't have problems with forgetting or being unable to jot down any ideas they may have. Inspiration can now freely strike them anytime, anywhere and they won't have to feel upset that they won't be able to remember everything because they can just use their tablet to take note of all of their ideas. With such a lightweight and small tablet, no one is going to feel like they're lugging heavy sacks of potatoes all over the place. The Samsung Galaxy Note actually has a whole lot of features but let's focus on one of the more important and useful ones for all the writers out there. This is the fact that this particular tablet actually comes with what is known as the S Pen. This is a digital pen (you can see an image of it below, along with some other images of the Samsung Galaxy Note), which lets you write down all sorts of things, including your story notes and ideas, of course. There is even a handwriting-to-text engine, which converts whatever you write down into digital type, making this a truly convenient and certainly very useful tool for writers. While tablets are nice and all and definitely convenient, it's still hard to try and write things on it by using the touch screen especially for those that are so used to the keyboard or those that just prefer the keyboard. Besides, many would think that writing would be easier by making use of a keyboard than just simply using a device's touchscreen or even using a digital pen. 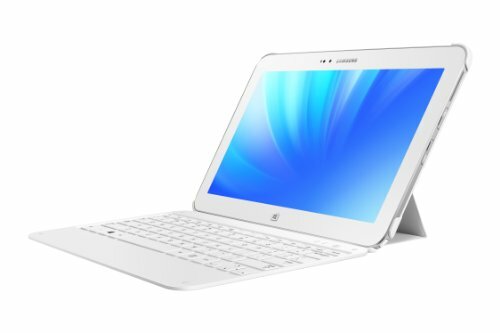 In this case, you might be better off with giving your writer a tablet with a keyboard such as in the case of the Samsung ATIV Tab 3, which is featured to the left. Incidentally, it also has a 10.1-inch display just like the previously-mentioned tablet so it's still small and lightweight, which doesn't make it a hassle to carry around. One of the best parts is, of course, the included keyboard, which makes this tablet easily able to double as a laptop. As such, it's easy to be able to switch between the tablet and the laptop and it's like you're getting both with this particular item. 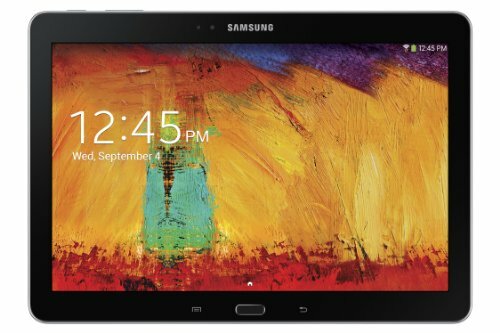 Aside from the many other features that this tablet has, it also comes with an S Pen as well as Samsung's Note 2.0 software. The former allows you to write down notes and the like on your tablet whilst the latter is the program or application that supports the pen in various ways. If you check out the Amazon product pages of either of these tablets, you'll see many more images as well as more information on their many other features that make these good choices for tablets even for non-writers. Furthermore, if you do decide to get this from Amazon.com, you can select to have the item gift-wrapped, which makes things easier for you if you are planning to give it as a present to your writer or other loved ones. There are some writers who prefer to make use of the traditional way of writing or at least wouldn't mind using this method once in a while. For these kinds of people, instead of giving them a technological device, you can instead give them notebooks and journals where they can write down their thoughts and story ideas and whatever else they want to. This is also an ideal Christmas gift choice if you don't want to spend way too much money on rather expensive tablets and laptops. This is because these paper notebooks and journals are certainly less expensive when compared to their technological counterparts. 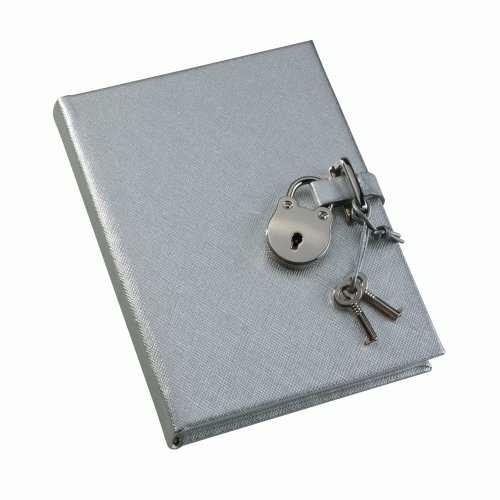 Of course, if you're planning to give items like these as gifts, you should pick out ones that look classy and elegant like the silver journal you can see featured above. It may look plain and ordinary but there's something about it that doesn't make it appear to be one of those cheap notebooks that aren't fit to be given as presents. You can even get this particular journal in pink and lime colors. So, what's with the lock? While you don't have to give your writer a journal or notebook with a lock, there's also nothing wrong with choosing to give him or her this type of gift. Some people are very private with their thoughts and ideas and may not yet be ready to share their story with the world especially if they are still in the process of writing their novels. Others may just prefer to keep their story under wraps first. And still others may also want to make use of their present as a diary of sorts. Of course, if you're giving someone a notebook or journal, you might also want to consider giving them a pen or pencil, which they can use to write on said notebook. Or you could just decide to give your writer a set of writing materials. 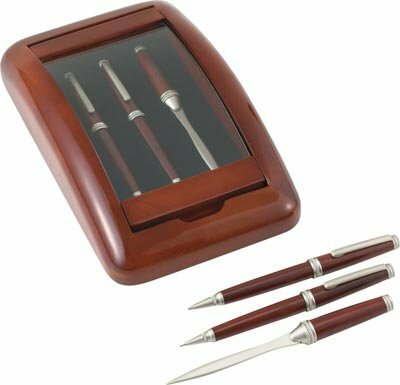 The item featured to the right certainly looks like it would do very well as a stand-alone Christmas gift, considering its quality look and the fact that you get a wood and glass case alongside not just a pen and pencil but also a letter opener. Which of these useful Christmas gifts are you planning to give to the writer that you know? These are just some of the useful ideas for Christmas gifts that you can choose to give to the writer or aspiring writer that you know. Any one of these gifts will surely be appreciated by its intended recipient. To make your Christmas present much more special, you can decide to add a personal and sincere message alongside said gift. You could write it on a Christmas card and send it along with the gift. The message or note doesn't have to be long. What's important is just that you say something a bit more meaningful than merely whatever may be written on the card that you got. @Mira - Word can be okay if you're just writing short articles or stories but if you're planning to write something that is really long, then it can be difficult to use Word to do so. Scrivener makes things so much easier for writers and even helps you organize all your notes, drafts, scenes, etc. I think there are other programs like it that are especially for writers. @AbbyFitz - thank you. Scrivener is very useful and helpful for writers because of all of its features but it's not intrusive so you don't have to utilize all of its features unless you want to. Yeah, if one is just going to give a Christmas gift anyway, it might as well be something that can be used by the recipient. I think that scrivener software would be very useful to a writer. I want to write a book now just so I can use it! Seriously though, I think everyone will appreciate gifts more if it's something that's not going to get tossed in the closet. Oh, and I see it's only $40! How very tempting! I love the Scrivener idea. Didn't think there was something beyond Word, but of course there had to be. So very useful, as I imagine from reading your comments about it. @Rose - books about writing can certainly be very useful for writers. I'd love to get either the Samsung Galaxy Note or the Samsung ATIV Tab 3. Tablets and laptops like that can be very useful in being able to jot down notes and ideas wherever you may be and they're both portable and lightweight. I love being given books about the writing process - you know the ones that talk about getting past writers block and how to plot novels. And I'd love to be given the Samsung Galaxy Note!